These offer a unique facility for visitors to the high peaks. 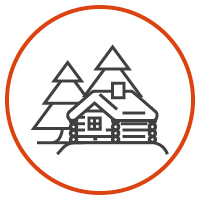 The mountain huts are the only places offering food and accommodation right in the heart of the UNESCO Dolomites Site. 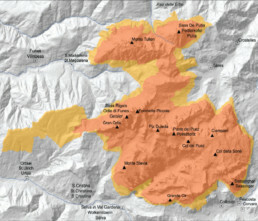 The Pelmo – Croda da Lago system extends to the North-West/South-East taking in Valle del Boite to the East, Val di Zoldo and Val Fiorentina to the South, Val Codalonga to the West, and Val Costeana to the North. This system, dominated by the Pelmo massif, is famous as one of the most beautiful of all the Dolomites landscapes. Shaped like a gigantic seat, Pelmo is known in the local language as Caregon del Padreterno, the Throne of the Eternal Father. As well as Pelmo, as you explore this system you will find plenty more stunning views to marvel at, among the most famous in the entire Dolomite region. The view from the Giau Pass towards Croda da Lago is one of the most iconic images of all. 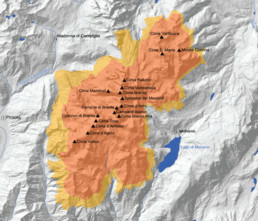 The Marmolada system, known as the Queen of the Dolomites, includes the highest peaks in the whole region, among them Punta Penìa, at 3,343m above sea level, the highest mountain in the Dolomites UNESCO World Heritage Site, making this system unique for the beauty of its landscape. Marmolada is a mountain of contrasts. The softly rolling contours at its foot, covered in woods and meadows, are abruptly broken by the dizzying height of its upper slopes with their pale calcareous rock and breath-taking crags. The northern face, home to the most extensive glacier in the Dolomite region, slopes down gracefully to the banks of the little lake of Fedaia. The southern face is one of the most challenging routes, much appreciated by the world’s mountaineers: a wall of nearly 1,000 meters, starting from the Val Ombretta screes, standing out against vertiginous peaks. This system is the second largest in the Dolomites UNESCO World Heritage Site, with a rich diversity of landscape and geology. 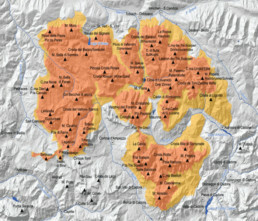 The system fans out over the Provinces of Belluno and Trento, bounded to the South-East by the Piave river valley, to the West by Val Cismon, to the North by the valleys of Trevignolo, Biois and Valle Agordina and to the North-East by Val Zoldana. The landscape of this system exhibits some striking contrasts. To the South the rugged scenery is scored by deep valleys and perpendicular rock faces, while in the North there is more variation with rolling Alpine pasturelands giving way to bare rock. The natural environment of this system is considered by all to be a treasure well worth protecting. 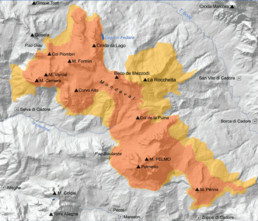 Much of it falls within the boundaries of two designated protected areas, Parco Nazionale Dolomiti Bellunesi and Parco Naturale Paneveggio – Pale di San Martino. The Dolomiti Friulane e d’Oltre Piave is a fairly compact, continuous system of peaks offering breath-taking views over its magical landscape. What makes this system special is its extensive wilderness areas. Here you can marvel at the sheer power of Mother Nature, largely untouched by human interference. The Parco Naturale delle Dolomiti Friulane is an area of natural parkland, designated as such in 1996 to preserve and enhance the geological and natural heritage of the system. It has a wonderful array of flora and fauna, the realm of the golden eagle, a bird of prey that only nests in the wildest of natural environments. 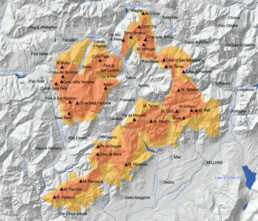 The Northern Dolomites system is the most extensive in the Dolomites UNESCO World Heritage List, stretching from Val Pusteria/Pustertal, to Val Badia/Gadertal from the valleys of Sesto/Sexten and San Cassiano/St.Kassian to the Boite and Piave ones. The system consists of four main areas: the Sesto/Sexten – Cadini Dolomites, the Fanes – Senes – Braies/Prags chains with the Tofane, the Cristallo, and the Cadore Dolomites. 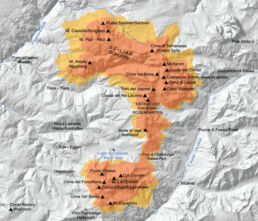 The Northern Dolomites system has an extraordinarily rich heritage in terms of landscape, natural history and geology. Because of this and the sheer size of the area, three protected areas have been created to safeguard and enhance its natural beauty: Parco Naturale Fanes – Senes – Braies / Naturpark Fanes – Senes – Prags, Parco Naturale Tre Cime / Naturpark Drei Zinnen, and Parco Naturale delle Dolomiti d’Ampezzo. The Puez – Odle/Geisler system is entirely contained within the protected area of the Parco Naturale Puez – Odle/Naturpark Puez – Geisler. It is made up of a relatively compact mountain chain surrounded by three delightful valleys: Val di Funes/Villnösser Tal to the North, Val Badia/Gadertal to the East, and Val Gardena/Grödental to the South. The Parco Naturale Puez – Odle/Naturpark Puez – Geisler is a veritable geological treasure trove, and the reason why it is often called “The Earth’s History Book”. The dazzling array of geological phenomena tells its story in terms that are plain to see, as do the landscapes, ranging from limestone plateaus to rolling pasturelands, from majestic peaks and dizzying rock walls to deep canyons and of course magical woodlands. The Sciliar/Schlern massif is between the Val d’Isarco/Eisacktal, Alpe di Siusi/Seiseralm and Val Gardena/Grödental. It is a compact massif of Dolomite rock and, depending on the perspective, it can resemble a giant monolith with a flat top or a rocky island, with an immense escarpment merging with the pasturelands below, just as in ancient times the atoll would melt into the bottom of the sea. Mount Catinaccio/Rosengarten, between the Passo di Costalunga/Karerpass, Alpe di Tires/Tierseralpl and the Fassa valley is a rugged, craggy crest with a number of peaks reaching an altitude of 3,000 meters. 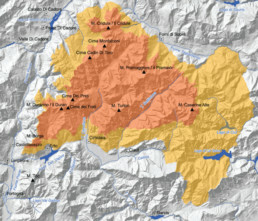 The Latemar chain is further South, between the Fiemme and Fassa valleys in Trentino and Val d’Ega/Eggental in Alto Adige/Südtirol. The scenic northern edge of the massif features the limpid waters of Lake Carezza/Karersee reflecting the peaks of the Campanili del Latemar/Latemartürme. This area is safeguarded by the Parco Naturale Sciliar – Catinaccio/Naturpark Schlern – Rosengarten. The Bletterbach is the smallest of the UNESCO Dolomites systems. This natural monument is a narrow gorge running through the territory of the Municipality of Aldino/Aldein, Monte Pausabella/Schönrast and Passo degli Oclini/Jochgrimm. Geographically separated from the other Dolomite chains, it is dominated by the summit of Corno Bianco/Weisshorn (2,317m). The enchanting landscape of the Bletterbach system is also a geological treasure-trove. The gorge was formed by the Bletterbach mountain stream eroding the rock formations of volcanic origin found in this area. The canyon narrows from a width of 200-300 meters at the top to 20-30 meters at its bottom and it is over 400 meters deep. The riverbed is punctuated in at least four places by spectacular waterfalls of dozens of meters in height. The upper part of the gorge opens up into a basin, 600-700m in diameter, over which the Corno Bianco/Weisshorn looms in all the immaculate glory of its white Dolomite rock. 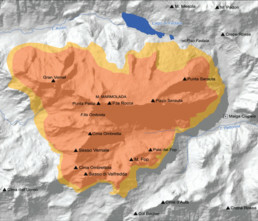 The Brenta Dolomites make up the westernmost part of the Dolomite region, on the western border of the Province of Trento. This chain is a Dolomite, bounded to the West by the Giudicarie valleys, to the East by Val di Non and to the North by Val di Sole. It is not just geography that separates the Brenta Dolomites from the other Dolomite chains: the distinctive morphology of the majestic, towering Brenta peaks, result of erosion carving them into jagged spires and lofty pinnacles of different sizes and shapes, stands in contrast to the more slender, fluid lines of the rest of the UNESCO Dolomites. The exceptional importance of the natural environment, landscape and geology of this Dolomite system is safeguarded by the Parco Naturale Adamello Brenta. The parkland environment contains a wide range of plants typical of the Alpine chain and a rich variety of fauna.